June 17th, 2008. Exactly two years to do the day. Do you remember where you were? I do. I was sitting in my Columbus, Ohio, apartment, alone. I prefer to watch Lakers games like that, because I’m an emotional wreck during them… especially any game of significance. A lot of people in Ohio weren’t born in LA, began their life there, and were raised as a Lakers fan. Sure, there are some people that follow them because they’re good at the sport of basketball, but there aren’t too many people in Ohio that pump Forum Blue and Gold through their veins like I do. Not claiming I’m the greatest Lakers fan in the world, far from it, but I simply care way too much about something that, at the end of the day, amounts to a children’s game. June 17th, 2008. There I sat. It was Game 6 of the 2008 NBA Finals. The Lakers, after having suffered the worst collapse since the Dallas Cowboy’s practice facility during Game 4, had rallied back to stave of elimination on their own court during Game 5, and forced the series back to Boston. The Lakers were trailing 3-2; we were down, but not out. I never doubt the Lakers. Something about having 15 NBA Banners hanging from the rafters (and knowing there could be as many as 31), has me always seeing the best. It’s basically the exact opposite of being a Cleveland Browns fan. (That is until Jake Delhome, Pro-Bowl QB, leads the Browns to their first Super Bowl Victory, but I digress). 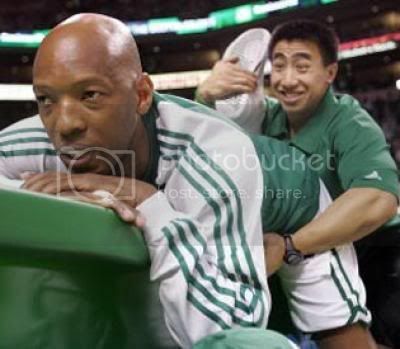 Sam Cassell, the ugliest member of the ugliest basketball team ever assembled. It didn’t take long to realize there would be no Game 7. The Boston Celtics, fielding the ugliest team that had ever seen the game of basketball, swarmed Kobe on defense. They punked Pau Gasol. Lamar Odom, suffering from some knee issues, may have been smoking weed on the beach back in LA. Things got hectic pretty quick, and by midway through the 3rd quarter, things had taken a turn for the worst. There were the 2008 Celtics, a hastily assembled, from rags-to-riches, trash-talking, chest-thumping, show-boating team, just straight mauling their way to their first championship in over 20 years. The Lakers quit. They did. There is no way around it. Everybody in a Lakers uniform quit by the end of the 3rd quarter. It was without a doubt, the lowest point of my Lakers fandom. And I once watched Smush Parker start a play-off game. I turned the game off. It’s a creed of mine, always staying until the end, but I just couldn’t. I hate the Celtics too much. I mean, I loathe them. It was the equivolent of watching my brother get beat with a bat and burried in a cornfield. The 2008 Lakers, beaten with a bat and buried alive in a cornfield. A cornfield in Boston no less. I turned the game off. I didn’t even see Kevin Garnett’s “ANYTHING IS POSSSIBLEEEE” post-game interview, and if I had, I may have walked into oncoming traffic. I was a wreck for about two weeks after that. I was so confident going into the series–and bam–just like that, I was punched in the gut. It was the worst feeling in the world. How could the Basketball Gods reward the Boston Celtics like that? Kevin Garnett had been “traded” to Boston by one of the greatest Celtics of all time! They were obnoxious, classless, one of the biggest cheap-shotting, ref-baiting group of clowns ever seen on an NBA court. They deserved to lift the same trophy that Magic Johnson used to lift? How could it come to this? And their fans. Don’t even get me started on the Boston Celtics fans. There they were, announcers raving about the “old school, die hard” Boston fan base. What a crock. A year prior to that, Kobe Bryant was getting “M-V-P” chants (before people like Zach Randolph and Dwight Howard were getting them) in the Garden. It’s true. Youtube it, and you will see for yourself. Red Auerbach probably rolled over in his grave. Actually, you don’t get graves when your soul has been damned into eternal fire and brimstone, so forget I even said that.